Museums & Galleries allow us to reach past ourselves, and experience parts of life through people who have gone on before us. These are things that are left behind. It’s exciting to think that when you stand before a work of art, you see it exactly the way the artist did when they were creating it. Money doesn’t have to be a factor. Many museums have free days or at least discount days. (And now with Groupons, you can go to them at 50-70% off anytime! lol) There are SO may different types of museums! Art Museums, Car Museums, Historical Landmarks, Art Galleries, etc. The world is your playground… use it!! QUESTIONS: Are you ever too old o learn? Are you really too busy to take out one hour per month to visit a museum or gallery? When you’re looking for a break from every day business or routine, why not go to a museum or gallery? p.s. 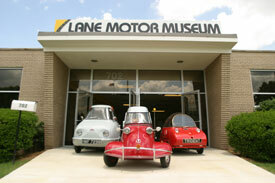 My next museum is the Lane Motor Museum here in Nashville, TN. I am taking my children this weekend! I had to share this video with you all today. This is not from my YouTube, however I saw it online today and it just backs up everything I have been talking about, and then some! Please take the short time to watch this and apply the principles to your life!! Fear is a very powerful force and usually a stronger motivator that happiness. If someone has a strong desire to do or attain something, yet an even stronger fear not to… guess which wins? Fear. Why is this? Because there is a stronger negative association to that thing than there is positive, so the negative wins. So how do we fix this, and enable yourself to face your fears? It’s actually very simple. You have to affix more positive associations with that thing than negative. I know this may sound strange. It is doable. I will explain how. You must focus your attention, instead of how bad something might be, on how bad NOT doing it will be! Focus on how bad it could be if you don’t!! Use fear to your advantage! Also, focus on how great something could be to do it. Change what you link fear to… it takes repeated practice, but it IS doable. You can change from being fearful of potential failure, and because of that fear, NOT doing something. Force yourself to fear how bad it could and will be if you don’t do it… how much you will miss out on… how horrible it will be if others don’t see you trying at all… use every negative association you can conjure up to make the fear of NOT attempting your slave! You have to force yourself to focus the fear where you want it, in order to change your mind and your behavior into trying being the only way and the only option for gaining pleasure over pain. QUESTION: What is something that you know you should do, yet have been fearful of? Think about what pain or fears you have associated with that thing which has kept you from doing it. CHALLENGE: Make 2 lists for the above thing you need to do. List 1: All of the great things that COULD come about if you do it. List 2: All of the absolutely horrible things that could come about if you DON’T do it. You do not have to share the specific thing with me publicly that you have been struggling with. These are very personal things in our hearts. I want to stress to you that you have more control over your mind that you think!!! Do not let anyone, especially yourself, keep you from doing something you know you need to or want to do. YOU CAN DO IT!!!! Change the way you think, and get our of your rut of not attempting it. How horrible is complacency! Make your 2 lists at this very moment!! Immediately start working on rewiring your thinking and putting fear to work for you, to motivate you to push and do it in fear of not attempting! Have an amazingly blessed day of action!